a fellow in Spain posts a sketch I drew for him in Madrid in 2001. With a little darkening of it in photoshop you can see it more clearly. Some artists have a foolproof convention sketch they dash off all the time, and I admit I do too. Then occasionally we go out on a limb and try something risky, and sometimes it works, as it does here. I'm first! Do I get the sketch? oh, wait, someone else already owns it. Oh,well... Thanks for the look. 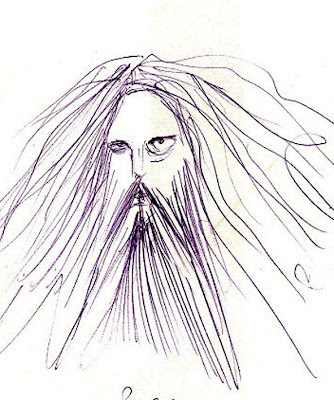 Recognize ye not the great big hairy Alan Moore? Sorry Love, never met him! I thought it was Howard Huges. I still think you should enter into the world of galleries. This is one of the finest pieces of modern art I've seen in years. Dave McKean is wishing he did this right now. sigh.. how I wish to have you scribble in my sketchbook..